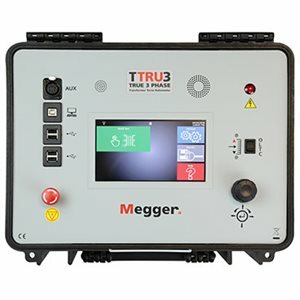 The NEW Megger TTRU3 transformer turns ratiometer uses a revolutionary design to perform a complete series of measurements on a transformer, including 3-phase step up turns ratio testing (patent pending). 3-phase voltage output offers numerous advantages to testing with today’s busy schedules. The TTRU3 is an important tool for determining the mechanical condition of transformers. All ratio tests are performed in one instrument, with only one 3-phase lead-set connection. The TTRU3 utilizes the latest 7 in. (180 mm) color touch display, as well as an optional printer so results are never lost. This is complimented with remote control which can be operated from a PC, as well as the ability to download results to a USB memory device.